This article is part of our series on the 4 Essential Types of Content Every Marketing Strategy Needs. Make sure to get your special free bonus at the end of the article. This week, we have something special for you. We are going to publish a five-part content marketing series, with a new article in the series each day. 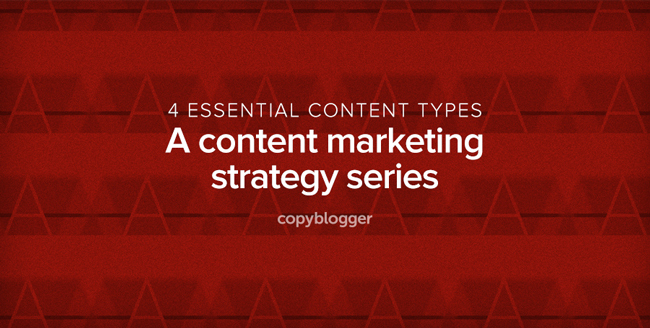 The series will focus on the four essential types of content every marketing strategy needs. Let me explain why that matters. What are the 4 essential content types? Different types of content play different roles in your marketing strategy. They help your business in different ways. Here at Copyblogger, we’ve been successfully using these four types of content for more than a decade. Keep in mind that these content types are not mutually exclusive. Sometimes a piece of content can play more than one role. They can work together and complement one another. In addition, although they all may have the same look, the same feel, and the same voice, they each serve different purposes. Because of that, they have different attributes, which we’ll talk about in detail in the week ahead. Attraction content helps you reach a new audience and get your message in front of new people. But eventually you’ll want to convince those people to trust you as an expert, so you’ll need to provide Authority content. Once you’ve established authority, your message will spread through Affinity content. Affinity content is how you build a community of like-minded people that share your beliefs. And it’s this community who will be your best customers. But nobody will listen to you — let alone buy from you — unless you create Action content. Sometimes these are discrete, standalone pieces of content. Sometimes they’re a blend of two of the types. Sometimes three. We’ve got examples that blend all four. Successfully using all four types of content on your website is what allows you to command larger fees for your services and charge more for your products. It’s what gets people to link to your content (without you even having to ask). It’s how you land guest posting opportunities you once thought were out of your reach. It’s how you get influencers to share your content on social media. Successfully using all four content types is also how you convince people to like you, trust you, and ultimately buy from you. But that’s not all. These people will not only become customers. They’ll become advocates, fans, and even, in some cases, friends. Masterfully weaving together these four content types is truly one of the best ways to build an audience that builds your business. I hope you enjoy this week of learning about the four essential types of content every marketing strategy needs. Stay tuned for my article about Attraction content tomorrow. Build a content strategy based on the four content types in this series! Get your free ebook, 4 Essential Types of Content Every Marketing Strategy Needs. Best introduction of four types of content. I’m looking ahead for more this week. Usually, list whose key words all start with the same letter are suspect – I always wonder what was left out or twisted out of recognition before it was included. Yet your list is solid and effective. Look forward to the rest of your ideas this week! I share your suspicion, Trevor. While we feel this list is comprehensive, I’m sure we’ll probably see good arguments on what’s missing, etc. Look forward to hearing from you again. We use these internally, and we agree with your assessment! It’s helpful to have shorthand, especially when you’re working on a team. Great introduction. Looking forward to this week’s lessons! You got me. Now I’m coming back every day this week. Thanks Matt! You are making me blush. Demian, the way you’ve introduced the four types of content, it makes me follow it up and find out particularly how affinity content should be written and which elements should be present there. Great, hope you enjoy, Rahman. How did you come up with the list…as there could be other [key] words used? Due to it’s Catchiness? lol not a word..
I’m waiting for the next part. One of the great things about English is the multiplicity of synonyms. So stoked about this series! You got me with “They’ll become advocates, fans, and even, in some cases, friends.”. Great Read! Looks like I will be checking back in every day this week for sure! This is awesome I love the four different types! This is so true and not too many people realise how to use these techniques effectively, but they can from your post! I am coming back everyday! Great information…I look forward to the rest of the content! Look forward to seeing you, Shaun. This is solid! You encapsulate so well the internal logic of content that moves its readership from curiosity to engagement to loyalty. I look forward to your forthcoming articles. Excellent start to a very useful series, Demian. Ready for what’s next. It would be actionable post for us to dive in and create the four types of post as the guidelines. I had read about being an authority a lot. It is interesting to see other 3 types and how to blend them together with unique thread. Looking forward to amazing gems. Looks quite thrilling, looking forward! Thanks for this great intro about the 4 ways to create killer content. I’m heading now to read the first series. Looking forward to read articles on those topics. I would be interested to read about Authority & Actionable content series. I’m very excited to see the topic of these articles Demian. This series is timely as I am in the process of finalizing my content strategy. Hey Damian I’m imagining you in a super hero costume designed by Rafal Tomal. With the Rainmaker logo on your chest and a blue cape. If the cape fits you gotta wear it!